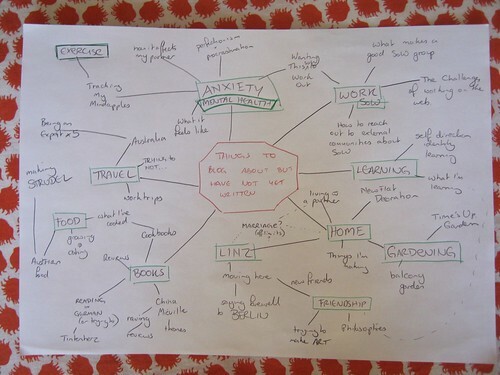 Sit down and on a piece of paper make a list, or a mind map, of blog posts you've been thinking about writing. Spend 10 minutes on this. Have a look at your list or mind map. Write it up and if necessary take a photo so that you can share it here. Spend 10 minutes on this. Post your list. Take 10 minutes max. Hooray! You have done some Writing for the Web! Stefanie Aug. 11, 2011, 9:02 a.m.
Pippa Buchanan May 9, 2011, 10:11 a.m. It used to feel that I blogged about almost everything and while there are some part of my life which are off limits it seems that I still want to write about a lot of things. Looking at this list, none of the topics seem too intimidating however some thoughts occured to me while doing the mind-map. I don't want my general blog at battlecat.net to become specialised. Still, I like beautiful photography and specialist blogs - how can I take inspiration from them? Eeek! If I blog all this I won't have time to actually do anything. how can I time manage this and become more efficient at blogging? Sitting in the sun with a cup of tea is great! Lynn Cook May 9, 2011, 7:56 p.m. In Reply To: Pippa Buchanan May 9, 2011, 10:11 a.m. It is indeed nice to sit in the sun, in my case late-autumn morning sunshine warming up my shins and fingers. The personal blog is interesting ... it used to be that most blogs were personal with people writing about all sorts of things, then there was an increase in specialisation, then businesses and organisations got blogs, or people started blogs with the idea that they could make money from advertising, the commercialisation of the blog. And facebook and twitter kind've took over as the place where you put all the snippets of your life but you can't develop much of a thought process or discussion with those platforms. So it'd be good to see a resurgence of personal blogs. I think they are a little like a front garden full of plants (writing) that you think are pretty, intriguing, stylish. A place for people to leave comments as they walk past: "Oh, how lovely!" although sometimes people steal your plants or leave junk mail (spam). You swap plants with your neighbours, or bring plants back from a friend's house, each plant has a story. You need to work in your garden regularly to keep it looking beautiful but it's not a major work. You might remodel slightly if you think it's not reflecting your style anymore. Pippa Buchanan May 10, 2011, 5:33 a.m. In Reply To: Lynn Cook May 9, 2011, 7:56 p.m. I love the garden / personal blog analogy! Though sometimes personal blogs can feel a little bit like a compost heap (I needed to continue the growth metaphor) - as in a place where you can throw away stuff, and given enough stirring and warmth they become something more useful! Lynn Cook May 7, 2011, 6:17 a.m. I think it's interesting that we all seem to be struggling with getting stuff out of our heads and onto the page. And that is why we are here in this study group, to get better at doing the Writing on the Web thing. Having read what people have written so far it looks like we are all sole practitioners, we all want to write for ourselves and our own projects, for what we believe in and find interesting. The gifts thing is interesting: I've found it helpful reading and looking at you alls' mind maps and some of the concerns and comments are gifts to me, moments that I connect with. And these gifts lead on in my mind to God given gifts, the things that seem sent to try us, but are also, long term paths. Amanda May 7, 2011, 5:22 a.m.
Stefanie Aug. 11, 2011, 8:43 a.m. In Reply To: Amanda May 7, 2011, 5:22 a.m. I like the wild mix of 'geek' and offline topics! One suggestion for improving: The "Inspiration" part seems to me a bit general and actually less inspirational than your other topics. Laura Hilliger May 6, 2011, 4:11 a.m.
My big problem is that I don't know what I want to write about until I am ready to write about something. I don't plan in advance, I just start ranting about whatever it is that is going through my mind at a particular moment. 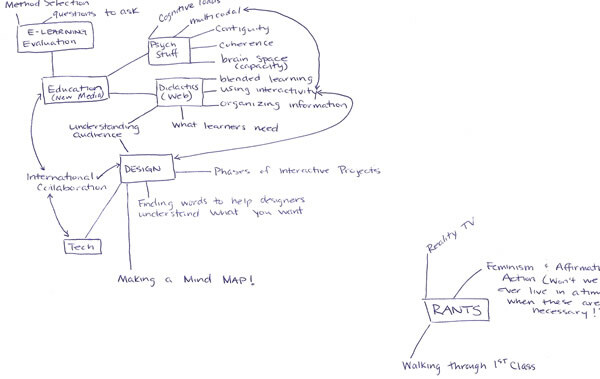 This is my first attempt at mind mapping blog posts, I think it went really well! Laura Hilliger May 6, 2011, 4:14 a.m. In Reply To: Laura Hilliger May 6, 2011, 4:11 a.m.
Ahhh! Formating is messed up (it looked right in the window:( if someone wants to tell me how I can edit my own comment, that would be helpful. Pippa Buchanan May 6, 2011, 6:26 a.m. In Reply To: Laura Hilliger May 6, 2011, 4:14 a.m. Using my amazing Lighthouse research skills I found that we'll be able to edit comments in release 0.5 - so this coming Monday... (May 9th). nzeribe April 30, 2011, 8:49 p.m.
My mind-map is here - be sure to click on the "map" view (top-left corner) to see it spatially; click on the links to read more. Jessica Ledbetter April 29, 2011, 2:17 p.m.
Pippa Buchanan April 25, 2011, 10:44 a.m.
Lynn - thank you for creating this task - I really like how you've described it and set time limits for the specific sections. Now - to sit down and work on it! Pippa Buchanan April 27, 2011, 12:30 p.m. In Reply To: Pippa Buchanan April 25, 2011, 10:44 a.m. I also edited the task description so that people felt invited to share a mind-map if they create one. Lynn Cook April 27, 2011, 4:56 p.m. In Reply To: Pippa Buchanan April 27, 2011, 12:30 p.m.
Ah! Very good - pictures of mind maps are very interesting and useful. Lynn Cook April 23, 2011, 10:21 p.m.